Also called the Star Fruit — because of it’s shape when cut crosswise, the Carambola is perhaps one the most common and easy-to-find fruits from the tropics. You’ll be hard pressed to find a grocery store that does not carry them… not to say they won’t be pricey. They do go on sale occasionally, but the best place to buy them is in Asian market where they are generally plentiful and cheaper. Watch out for overripe fruit though… as most produce in your average Asian grocery store tends to be a bit on the “older” side. Carambola or Starfruit is the fruit of Averrhoa carambola, a species of tree native to Indonesia, India and Sri Lanka. The tree and fruit is popular throughout Southeast Asia, Malaysia and parts of East Asia. It is also grown throughout the tropics such as in Trinidad, Guyana SA and in the United States, in south Florida, most parts of Brazil and Hawaii. It is closely related to the bilimbi. It’s best to consume a Carambola when ripe. An unripe fruit will appear green, while a ripe Carambola will display colors of bright yellow with a light shade of green. It will also have brown ridges at the five edges and feel firm. An overripe fruit will be yellow with brown spots. The fruit is entirely edible, including the slightly waxy skin. It is sweet without being overwhelming and extremely juicy. The taste is difficult to compare, but it has been likened to a mix of papaya, orange and grapefruit all at once. For complete instructions on how to prepare star fruit for consumption, see How to Enjoy Star Fruit. Star fruit is one of the “superfruits” – it is rich in antioxidants and vitamin C, and low in sugar, sodium and acid. Star fruit is a potent source of both primary and secondary polyphenolic antioxidants. Studies have shown that primary antioxidants can help prevent the damage of free radicals and that secondary antioxidants can help reverse the damage that already exists in our systems. Vitamin C is an essential ingredient in a strong immune system and general well-being. 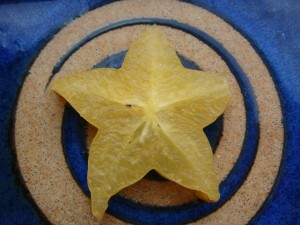 I love star fruits. They are sweet, juicy and ZERO points on the Weight Watchers diet! I like to slice them up and eat them raw or run them through my juicer. My 4-yo loves them too… these fruits are great if you have a particularly picky child — due to the inherent shape and sweetness. They also look great on top of a fruit salad…. as a cool decoration. This site also has some yummy-sounding star fruit recipe suggestions. It is difficult to describe what they taste like… as they are quite unique. I’m not sure that I agree with Wikipedia’s suggestion of papaya, orange and grapefruit. I actually don’t think I taste any of those flavors! To me, a star fruit is slightly grape-like with maybe a little apple thrown it. It definitely has some citrus qualities to it, but more like a sweet lemon. It has a bit of “pucker” to it… not because it’s bitter like a grapefruit, but more because it has a slight acerbic quality to it… sort of like a Sharon Fruit. If you want to try something new, but are afraid of tasting anything too “out there”, the Carambola is for you. It’s mild and hard not to like!